Can you believe it? After 9 months, Julia, our voiceless cantor can sing again. We are very grateful for all her preparation for the music which added so much to the pilgrimage. Listen to her angelic voice and be blessed by her sweet spirit. We are delighted that you are considering a trip to the Holy Land with us next January. Click here to view the brochure and registration form. We are now taking deposits for the pilgrimage. To save your spot, fill out the registration form and mail with your deposit to Bonnie Lane at Golden Eagle Travel, 21250 Excelsior Blvd., Excelsior, MN 55331. Fr. Chris Walsh and Fr. Matthew Guckin from Pennsylvania are joining us as spirtual directors as well as Msgr. Pricco who travelled with us two years ago and was a wonderful minister of the sacraments. Our cantor is Julia Waletzko who cantors at St. Vincent de Paul in Osseo, MN. Contact us or Bonnie if you have questions or concerns. Cavins Tours phone number --763-420-1074. If you wish to have information sent to any of your friends, let us know and we will email the information or mail it depending upon preference. 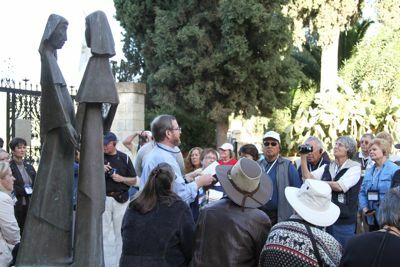 We so enjoy bringing pilgrims to experience the Holy Land accompanied by dynamic priests, partaking together in daily mass, learning about the holy sites with friendly and experienced guides and walking in places where Jesus, Mary and the Apostles walked! It is a life-changing experience and we hope you can join us! Hear what others are saying about our past pilgrimages! This was the most organized trip I have ever been on. When I found out that there were going to be 115 people, I got very nervous. I do not hear very well and was very worried that I would not be able to hear but the ear pieces worked so very well. I didn’t miss anything said by the guide, Jeff, Emily, Bonnie, or Father. You couldn’t have made us feel more welcome. I was travelling by myself (my husband had died a yr. earlier). It was the first time I had gone on a tour not knowing anyone. I certainly didn’t have to worry—everyone was so very friendly. Donna D.